Oxford United have signed midfielder John Lundstram on a free transfer following his departure from Everton. Lundstram, who has played for England up to Under-20 level, has agreed a two-year contract, having ended last season on loan at Scunthorpe. The 21-year-old came through the Everton youth system but never made a first-team appearance. "The club feels like it's going places, so I had no hesitation in coming," Lundstram told the club's website. "It's a big move for me because it's my first permanent transfer rather than a loan and I wanted to make sure that I joined the right club, one that has ambition and is looking to win things." Lundstram had loan spells at Doncaster, Yeovil, Leyton Orient, Blackpool and Scunthorpe - the latter three all last season. "John is a player who a lot of clubs have been monitoring. 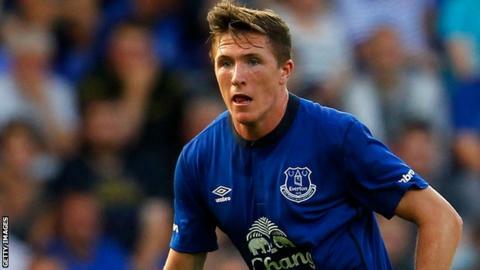 Everton offered him a new deal but he felt it was the right time to make a permanent move," U's manager Michael Appleton said. "He gets on the ball, links things through the middle and he's combative so he won't shy away from the physical side of the game. "It gives us a lot of competition in the middle of the park and we are really happy to have him here."